← Dr. SkySkull talking invisibility in the News & Observer! He is certainly the best British novelist in his field and deserves the widest recognition. Blackburn’s work fell out of print after his death and it is only recently that Valancourt began to re-release them in new edition, some of which have introductions written by me! I thought I’d briefly highlight two of these: A Scent of New-Mown Hay (1958) and The Flame and the Wind (1967). A Scent of New-Mown Hay is in fact Blackburn’s earliest novel and the one that catapulted him to instant success as an author. It carries most of the elements that would become mainstays in his writing, including a set of stock characters, a diabolical plague, and a genre-bending mixture of horror, thriller, and espionage. The novel begins when British intelligence learns that a huge, remote — and expanding — area of northern Russia is being evacuated, burned and cordoned off. General Charles Kirk quickly dismisses suggestions that it might be a testing area for new weapons, or a region under political upheaval. Soon he learns that a horrible fungal plague has been unleashed in the area, transforming those it infects into something not quite human. As the winds begin to carry the infection towards Britain, Kirk and his colleagues race to uncover the source of the infection and find a cure for it. Their search will lead them to fanatical Nazis, deadly experiments and, just possibly, a new and terrible phase of human evolution. Like all of Blackburn’s novels, A Scent of New-Mown Hay is fast-paced and unpredictable, with plenty of twists and turns to keep you guessing. Also, it is genuinely horrifying — Blackburn is very good at imagining both really horrible diseases and horrible situations. General Charles Kirk made regular appearances through the rest of Blackburn’s writing career, including the novels Broken Boy (1959), Nothing but the Night (1968) and The Face of the Lion (1976), all books that I’ve written introductions to! Like many of Blackburn’s recurring characters, he becomes almost an old friend after encountering him several times. 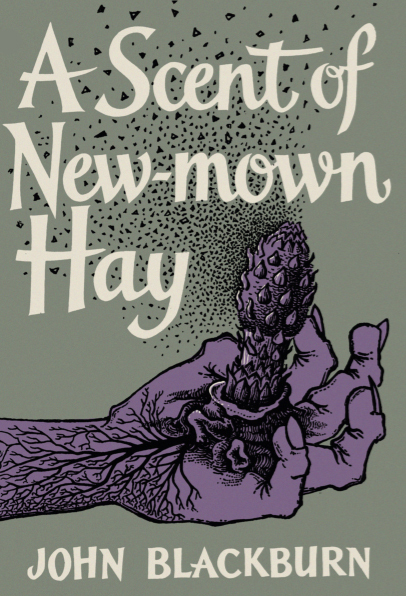 A Scent of New-Mown Hay contains a new introduction by Prof. Darren Harris-Fain, and the cover is a reproduction of one of the rarest original covers. It is one of Blackburn’s best novels, and a great introduction to his work. 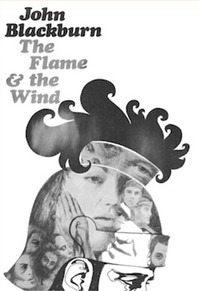 The Flame and the Wind (1967) is, on the other hand, Blackburn’s most unusual and unique novel! A historical novel set in the immediate years following the crucifixion of Jesus, the story follows the investigations of Sextus Marcellus Ennius, a spy for the Roman empire, who has been tasked with solving the mystery of Christ: was he a man, or a God? The empire is threatened by the rapid growth of Christianity, whose followers are fearless and persuasive. In an adventure that will stretch from Palestine to Rome itself, Sextus faces unending danger and intrigue in his attempts to find the truth. Even though this may sound rather tame in comparison to the rest of Blackburn’s work, it is very much a horror-thriller in line with the rest of his writing. The story is quite epic in scope — covering the ascension of Caligula to the throne at the same time that Christianity is spreading, I really felt like I was with the characters witnessing titanic events playing out. Blackburn populates the novel with a variety of intriguing characters, some historical, some biblical, that adds to its grandiose atmosphere. The Flame and the Wind also features another introduction written by me, and the cover is a reproduction of Bill Botten’s artwork from the first edition. I didn’t really know what to expect when I started reading the novel, but it did not disappoint — I found it nearly impossible to stop reading from beginning to end. Highly recommended as both a work of historical fiction as well as a work of mystery and horror. I should also briefly mention another Blackburn novel that was recently released: Blue Octavo (1963)! One of Blackburn’s straight-up mysteries, it is a really enjoyable story that involves a series of murders that are centered on the existence of a rare and seemingly unimportant book and the world of antiquarian book sales. Blue Octavo features my favorite Blackburn character, the obnoxious and egotistical adventurer J. Moldon Mott — but I will hopefully have more to say about him in a future post!